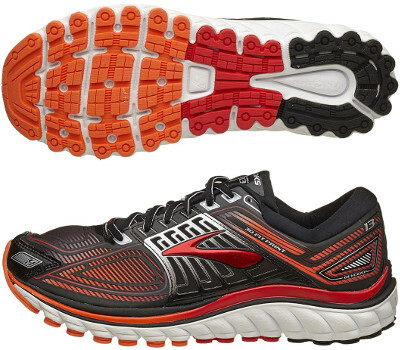 Brooks Glycerin 13 are neutral cushioned running shoes. The Brooks Glycerin 13 is the premium model from Seattle's brand: plenty of cushioning, high quality materials and of course... top price. The Glycerin saga features great comfort for neutral runners with medium/high arc who enjoy high mileage journeys. There is not much room to surprise after the revolution its predecessor the Brooks Glycerin 12 starred few months ago. Major change is present in the upper where 3D Fit Print technology has been improved to provide a softer but secure fit. Wraparound collar adds the finishing touch for a perfect blend of ideal fit and plush comfort around the ankle. Rest of the shoe remains the same and platform is shared among other models like its relative with pronation control the Brooks Transcend 2. Midsole material Super DNA adapts to each stride taken while ensuring plush comfort and shock absorption. Outsole disperses pressure (through Ideal Pressure Zones) evenly in the heel for smoother ride.